With Mother’s Day just five days away, it’s already too late to send your artistic masterpiece from iPhoto for printing with Apple — the cutoff was last week. But that does not mean you’re out of options for photography-related gifts when it comes to doing something nice for Mom. The following apps can be used to tap into your creative side and make a customized gift. Create an original photo collage – Shape Collage ($1.99, Universal, $24.99 Mac) will arrange your photos into just about any shape imaginable. You could arrange your photos to resemble a word, phrase or sentence. 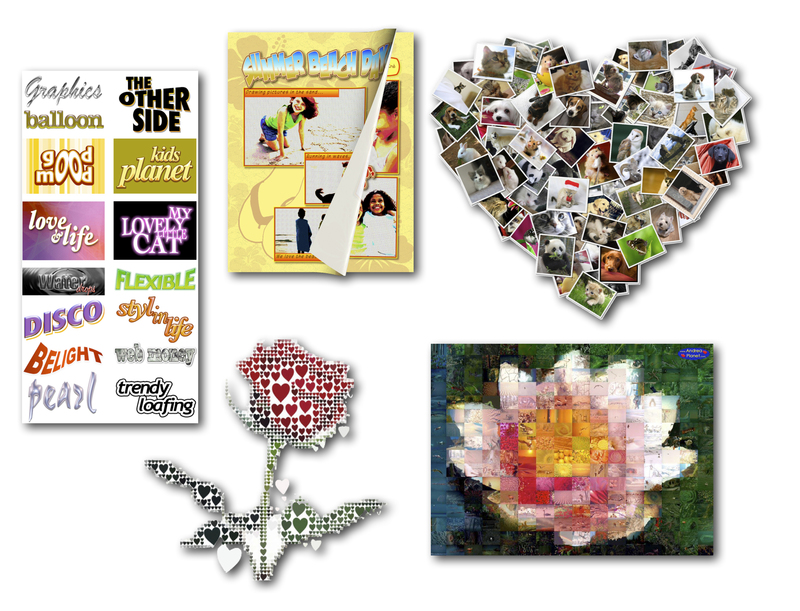 You can even arrange your photos into different shapes like flowers, symbols and hearts. The Mac version will even allow you to save the collage as a Photoshop file, where you can re-arrange each photo individually. Shape a mosaic of your own – Mosaics take every day objects and create an image by placing different size, shape and colored versions of the objects next to each other. cf/x also does this with their Mosaic ($19.99 Mac) app. Take a photo of your mom’s favorite garden or landscape and use it to creat a really cool image that looks like you put it together yourself by hand. The controls let you choose how realistic, or artistic you want the piece to be. Discover a photo mosaic – Take a large set of photos from your childhood and have them arranged to resemble a single more recent photo of yourself — it is a magical process to witness. AndreaMosaic (donation, Mac) has been doing just this for just over 10 years now. AndreaMosaic also has the ability to create your own library of photos to make the final mosaic from rather than use stock photos from a shared online repository. Remember a comic moment – Take one of your favorite scenes from your life that you love to talk about and document it with Comic Life 2 ($4.99 iPad, $29.99 Mac). You can even cartoon-ize the photos and distort the images for dramatic effect. Comic life also has a library of speech bubbles to help you bring the photos to life. Craft some thoughtful text – What you want to say is up to you, how you say it is another matter entirely. With Art Text 2 ($19.99 Mac) you can express yourself with an endless arrangement of textual options. Make your words glow with style by adding layers of borders, shadows and even adda glossy effect to the font itself. Print it all out – When all is said and done you may be looking for some place to print out your masterpiece. Using your iPhone, iPad or Safari on your Mac, you can send your photos directly to a nearby Walgreens (free on iPhone, iPad and Safari) for same-day processing. This same-day processing includes creating Posters, Canvas Prints and even Photo Books. Any one of these apps can be used to create a single piece of artwork worthy of framing for Mom. You can consider combining several techniques together and craft your own card to accompany whatever else you are getting for Mom this year. Even when the mother on your shopping list is your spouse, the above can be great art projects you can do with the kids. Show them how they can use their iPhone, iPad or iMac to create something really special this Mother’s Day. Printicular is a great print app that will print photos from Instagram, Facebook, Flickr, Dropbox, Google+, Picassa and Camera Roll! I would also try Bazaart – create memorable collages from Pinterest pins. Ahh! Almost forgot – thanks for the reminder! No excuse for missing mothers day this year !! Thanx for the wonderful ideas……..